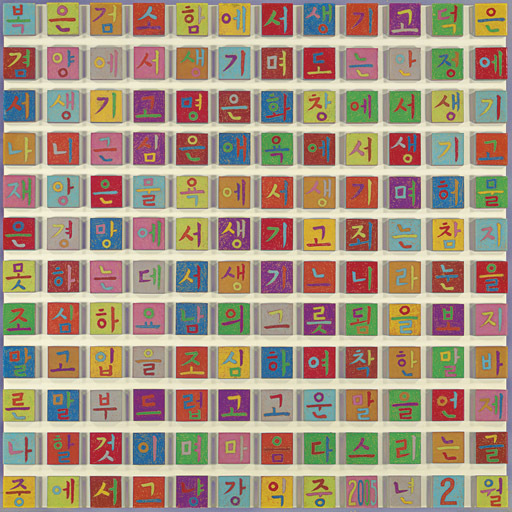 The artist's "Things I believe" are painted in Korean hangul script across 144 3 x 3-inch blocks of wood: "luck begins with frugality; respect begins with humility; truth begins with balance; enlightenment begins with a smile; anxiety begins with hatred; disaster begins with greed; shame begins with ignorance; sin begins with lack of patience; and everything begins with our eyes and mouths." Ik-Joong Kang, who lives and works in the Chelsea district of New York City, received his BFA from Hong Ik University, Seoul, and his MFA from Pratt Institute in New York. Kang has exhibited widely, including a one-person exhibition at the Whitney Museum of American Art at Philip Morris, New York, in 1996. and a two-person exhibition with Nam June Paik at the Whitney Museum of American Art at Champion, Connecticut. He had group exhibitions at the Museum of Contemporay Art. Los Angeles, the Ludwig Museum, Cologne, Germany, and the National Museum of Contemporary Art, Seoul. He was awarded the Special Merit prize in the 47th Venice Biennale in 1997. In 2000, he finished a permanent mural project, which was installed at the San Francisco International Airport. His one-person exhibition will be shown at the Carl Solway Gallery, Cincinnati, in September, 2007. Kang has received many awards, including a Louis Comfort Tiffany Foundation Fellowship and a Joan Mitchell Foundation Fellowship. Kang's work is in the collection of the Whitney Museum, the Ludwig Museum, the Leeum Samsung Museum of Art, Seoul, the Museum of Contemporary Art, Los Angeles, California, and the President's Committee on the Arts and the Humanities, Washington, D.C.